I have been back in the pottery making pots again. 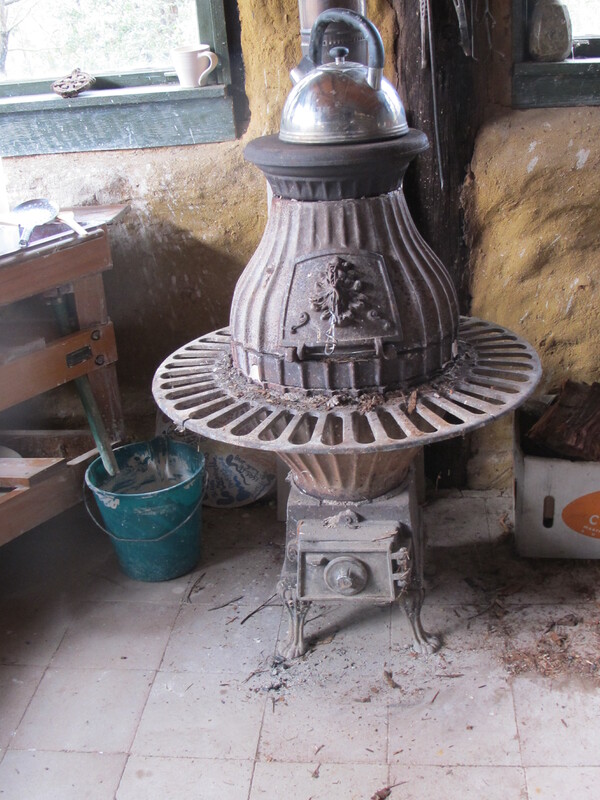 Now that all our winter firing workshops are finished. I have my kiln back to myself. I am throwing more pots for my own firing. As the weather warms up, pots don’t take quite so long to firm up as they were taking a couple of months ago. 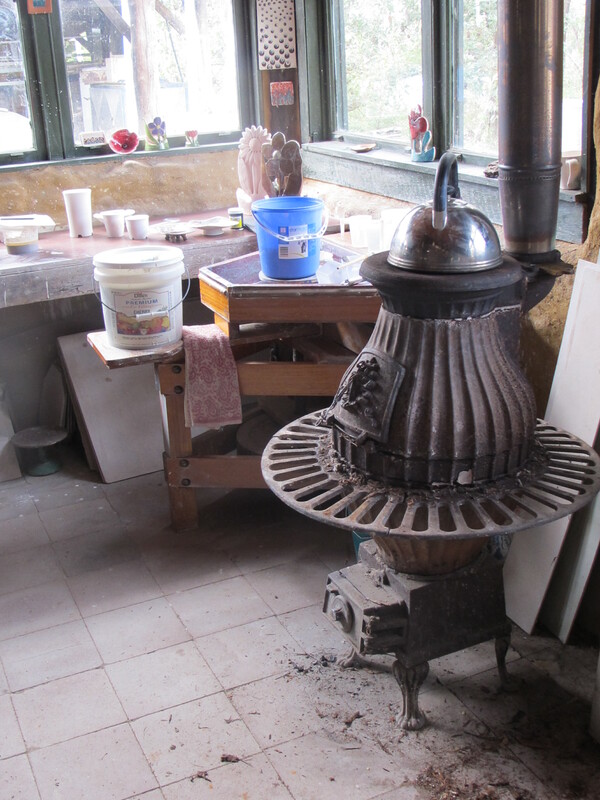 On a few days it is cold enough to light the pot-belly stove in the pottery. It’s nice in here with the fire going. I respond to its warmth. It’s an old, solid, cast iron thing that we have been using continuously for the past 35 years. I have given it one overhaul about ten years ago as all the joints were creeping apart. The original bolts had long since corroded away and it was more or less held together by the rust and friction. It had never had the correct flue pipe fitted for its size. 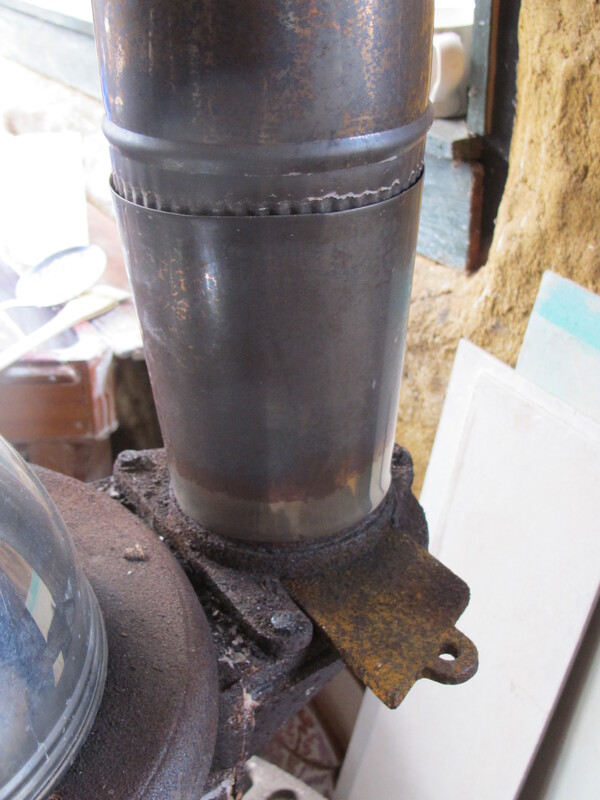 The original flue outlet was designed for a 100mm. dia pipe, which was woefully too small and it always smoked, as it couldn’t get enough draught going through it to burn the capacity of the wood that it could hold. I decided to take it to bits and overhaul it, by sealing a lot of the joints with a clay paste and reassembling it with new stainless steel bolts. I also increased the flue pipe size from 100 mm. to 125 mm. I make an adaptor out of some stainless steel sheet off-cut that I have that seems to be just about the right size – because I can. It’s taken me 20 years to get around to it and now in just 3 hours, it’s working just as it should, if the designers had bothered to build it and test it, to see if it worked OK, then re-designed it with the correct flue outlet. Now it works a whole lot better. Nothing is ever finished and nothing is ever perfect. I can hear out the window that Mrs Grey Thrush is calling her mate. A beautiful chirping worble/whissle. She calls and she calls. She waits and then starts again. I walk outside to see her on a nearby branch. Her song is so lovely. Eventually her mate appears and they fly off together, in a twisting, swerving, swooping flight. So closely mimicking each other. Maybe it’s a mating ritual? It’s that time of year, spring is approaching. Maybe they are responding to the warmth? 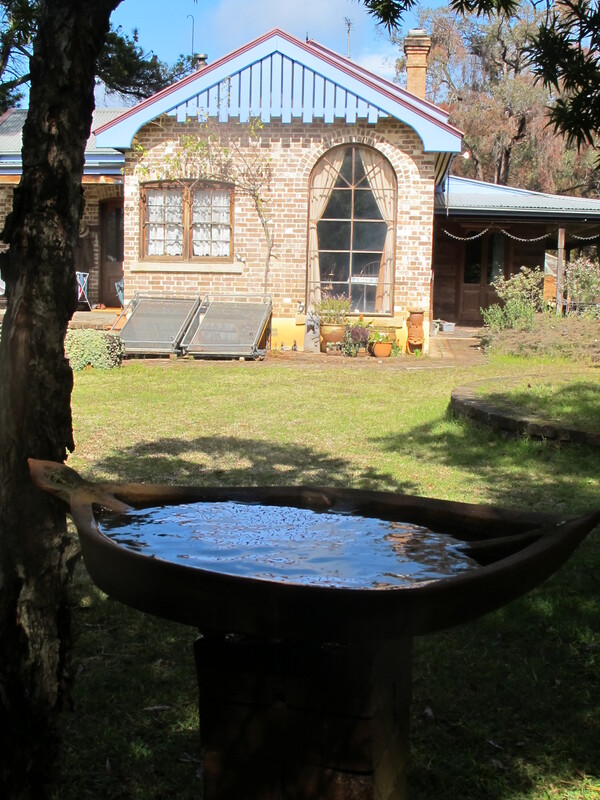 There is a lot of activity around the bird bath. 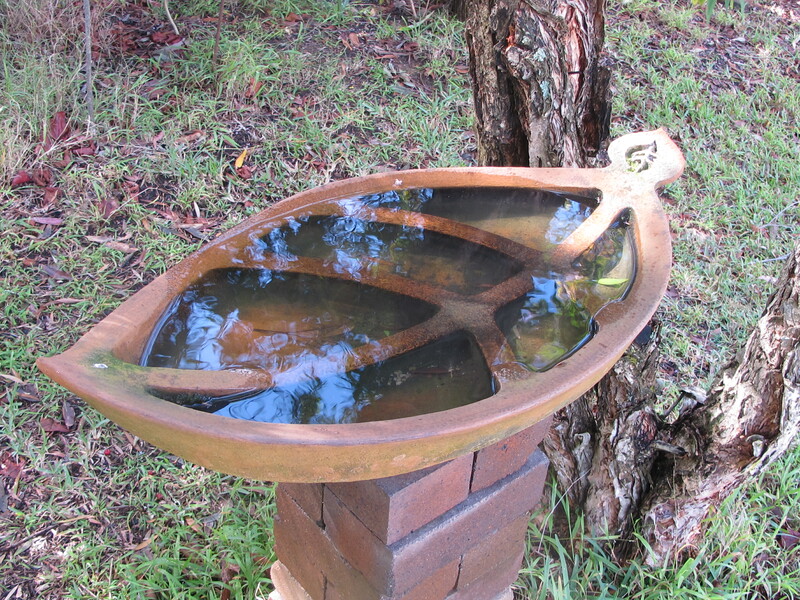 I made a leaf shape, shallow, ribbed bird bath. It is sited on a brick pillar in among some small trees and shrubs out in the garden, viewable from the kitchen window. We tried several places. This is the best place that we have tried so far. Nothing is perfect. I can see that there is a distinct pecking order in the way that birds organise their bathing. The bigger birds simply push in and force out the smaller lighter birds. Size is everything, or so it seems. ‘Nature, red in tooth and claw’. In nature you just take what you can, if you can. If you can’t defend your stake, then you loose it. We don’t feed the birds. I don’t think that it is good for them. We have created a rich and varied environment here. The animals have to make their own living as best they can. We have an enormous number of birds living here or passing through on a regular basis, so we must be doing something right. 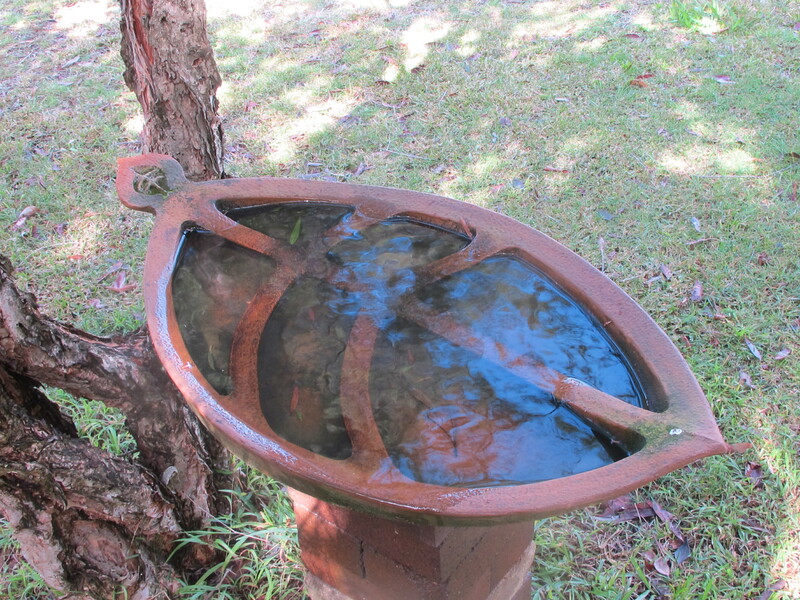 Once the larger birds have moved off, all the smaller birds come back in to the bird bath again. I see that red banded finches and eastern spine bills have no problem sharing together, or robins and wrens. There are a flock of little blue wrens, all young males I suppose. They swarm across the lawn and through the low shrubs and undergrowth, then swing around and come back again. They hang around most of the day, flitting in and out of sight. There must be 15 or 20 of them. Not a Jenny in sight today. Over at the site of the burning pile that we lit up last week. There are a huge mass of red banded finches. They are busy all around and everywhere. 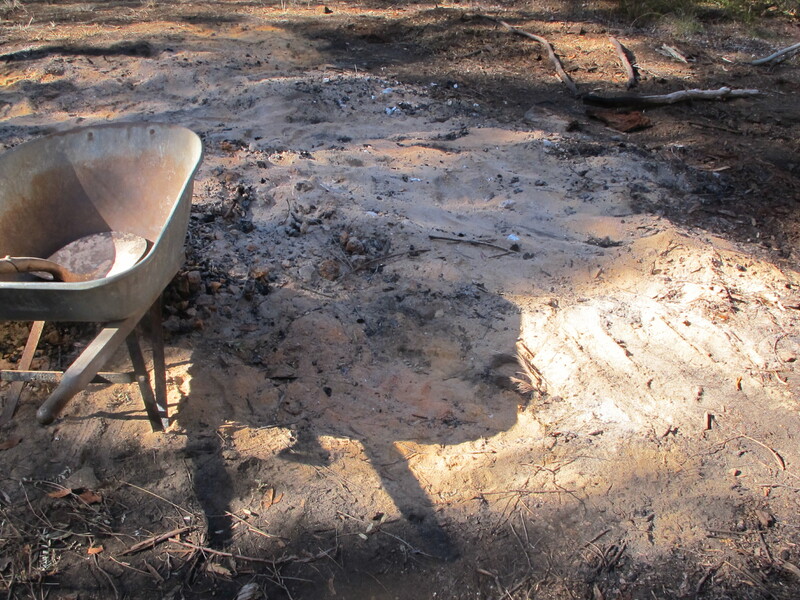 For safety reasons, our burning pile is a long way from our house, over in a clearing in the bush. There are so many birds over here in the thicket of bush all around the site. I see them working over the pile of ashes. They always seem to be in around here. They are interested in the ashes. I can’t seem to see what they are eating, if anything, but they are always here. Is it the warmth? Or maybe they are after some salt from the ash? I really don’t know! Maybe they are just responding to the warmth. We all do. The embers and ash have now cooled down and the little birds swam over the site looking for whatever it is that they look for. Masses of them dart in and out of the low undergrowth and shrubs into the clearing and out again. I always find it amusing and amazing. Always so rewarding! I love the fact that they are here in numbers these days. When we came here to this barren block 38 years ago, there weren’t any to be seen. We have planted thousands of bushes and shrubs over the years. We have stopped the clearing and let the bush grow back in places. There is so much more suitable habitat here now. Build it, and they will come! The finches keep a certain distance, but don’t seem to mind me being in their place I don’t scare them or threaten them. I love them being here. I respond to them with warmth – they, in turn, ignore me. Nothing is perfect. I test the ash pile to see that it is cool enough to collect. I shovel the whitest and fluffiest ash on the top of the pile into a plastic garbage bin for use as glaze material. I get about 20 kgs in there. 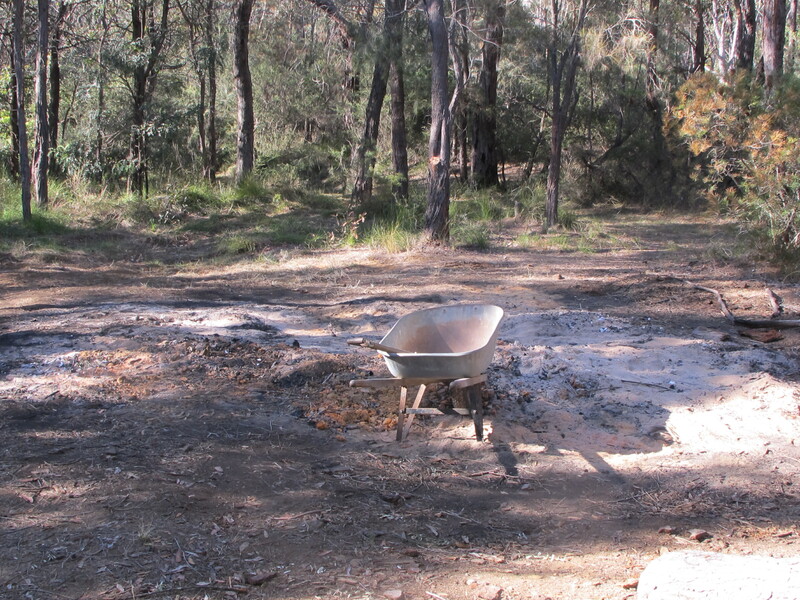 Next I shovel up the heavier darker ash into a wheel barrow to use as fertiliser. I manage to get 3 of these wheel barrows-full from the pile. Possibly 80 to 100 kgs in all. That’s a lot of ash! It’s a good general fertiliser for vegetables, fruit trees and shrubs. There is still a lot more ash there. Abundance! I have enough for the time being. The rest, as it goes down, is mixed with roasted top-soil, dirt and some stones. Although no good for glazes, it will still be useful if I need some more for fertiliser, but it is unlikely to remain there, as it will easily blow away if we have strong winds, or wash away if we have some heavy rain. Nothing lasts. I spread it around the garden and orchards, all around the drip line of the trees. 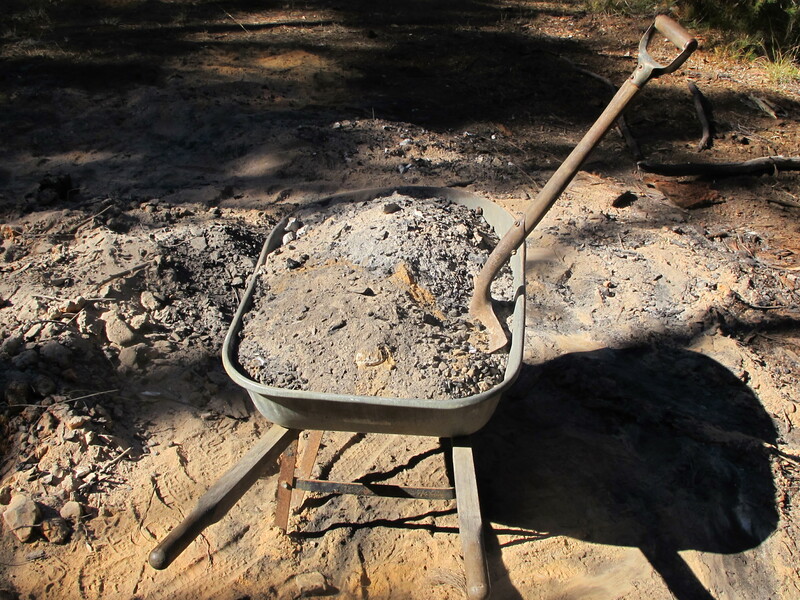 Wood ash contains potassium and calcium amongst other things. Potassium is very good at this time of year to stimulate flowering and fruit set in fruit trees. The ash also has some unburnt charcoal, this is also very good for the soil. There are even some burnt bones in the ash pile, from old marrow-bone stock residues that I threw onto the pile, because bones attract rats to the compost and the worms don’t eat them. So burning the used bones is the best solution. If we don’t have a burning pile ready to go. I dispose of them in the firebox of the kitchen stove or sometimes in the kiln. 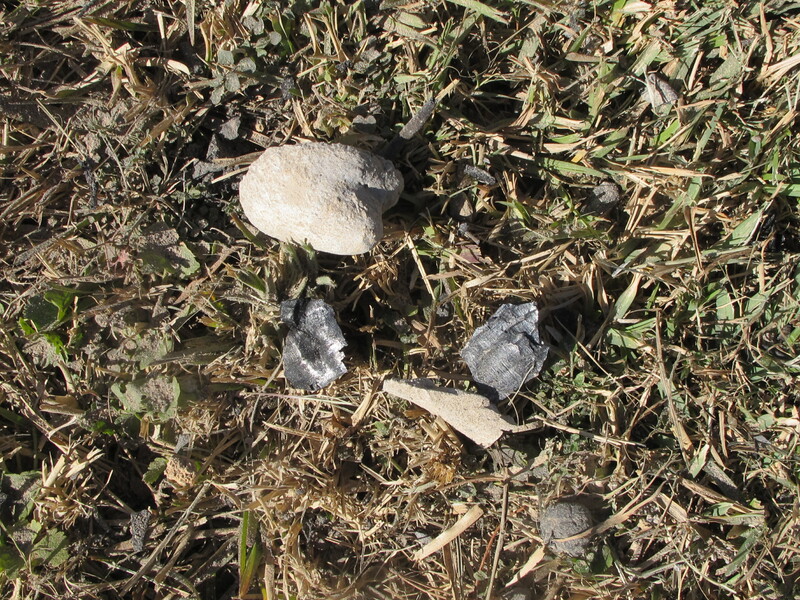 Burnt bone is a slow release form of calcium phosphate. So in this instance we have the major plant nutrients. Potassium, Calcium and Phosphate. All we need is some nitrogen and we get this from chicken pooh. 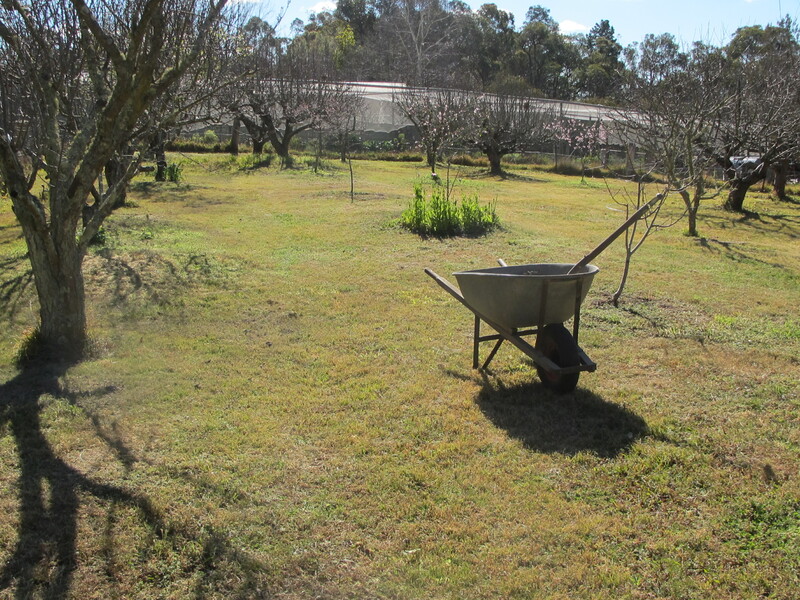 As well as fertilising, we have been pruning and cleaning up around the garden and orchards. There is always too much to do, but we just do what we can. I have only just finished pruning the almond trees a few weeks ago and now they are out in blossom. 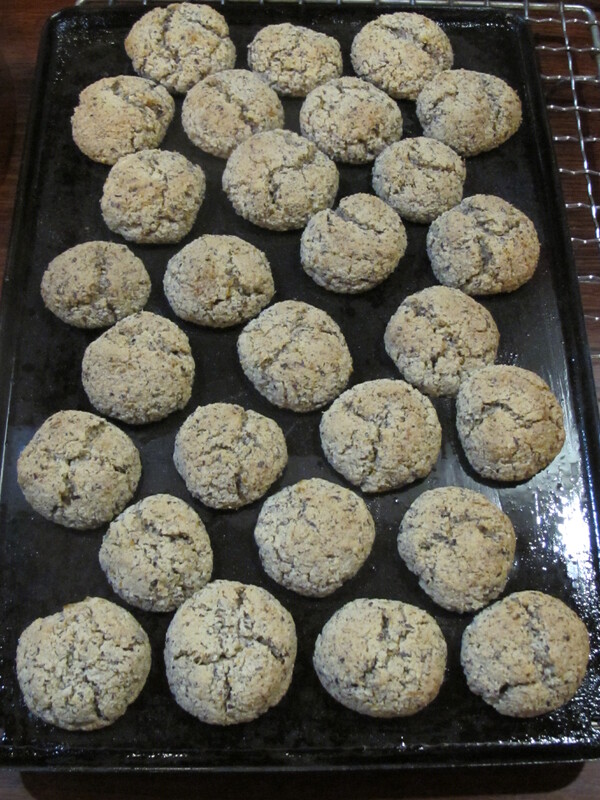 Janine makes some very nice little almond biscuits. She has almost run out of almonds, so she substitutes half of the recipe with hazel nut meal. These tiny biscuits are delicious. Crisp and crunchy on the out side, while remaining soft and chewy on the inside. vanilla paste to taste – less than 1/2 a teaspoon. 1/4 teaspoon of cinnamon – generous, maybe up to half. To your taste. It’s probably better and easier if you take the butter out of the fridge in the morning that you plan to cook. It’s easier to use if its softer, but you already know that I’m sure. 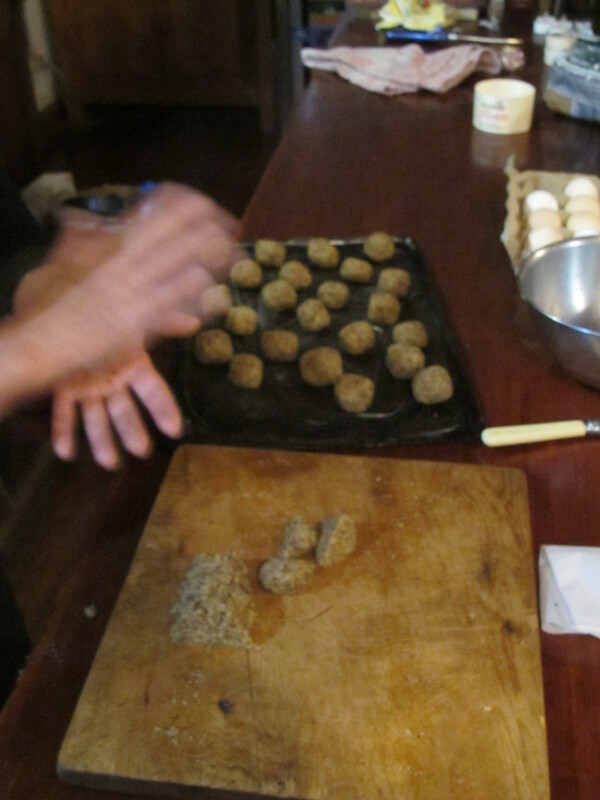 Roll the mixture into little balls and cook them on a buttered tray at 180oC for 15 to 20 mins. Don’t over cook, or they get too hard and loose their charm. They are so nice, coming warm and crunchy from the oven. I respond to the sweetness and the warmth. So That’s the recipe, but on this occasion, the lady with the zest for life uses twice as much zest, because she likes it that way. She adds 2 eggs and uses half hazelnut meal/half almond meal, because that is what she has. These little melt-in-the-mouth moments are just as yummy, if not better, so it just goes to show that the recipe is only a starting point and a guide. It’s not a must do, it’s just an idea, an idea that is worth thinking about. The rest is all experimentation. Like life. They are so delicious – nothing lasts! I thank her and she gives me a hug. Warm regards from his zesty Ms. and her fertile Mr.